"Thank you, Melissa Merlin and Husch Blackwell, for the superb job you did in helping MidWest U.S. China Association. Your expertise was thorough and professional. USHCA can now move forward due to your great work." 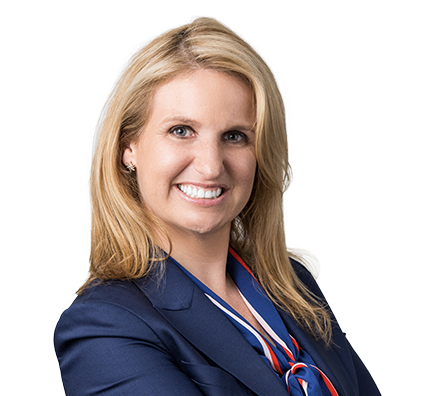 Melissa focuses on product liability, commercial, and employment litigation. She works closely with product manufacturers and automotive suppliers to defend wrongful death and catastrophic injury cases across the country. Melissa's results-driven counsel and exceptional client service ensures the best possible outcomes in product liability lawsuits, contractual disputes, insurance coverage matters, professional liability claims, and employment disputes. Serving on the national counsel product liability team for one of the world’s largest airbag electronic component suppliers. Representing consumer product manufacturers in fire cases involving death and catastrophic injury. Serving on lead and local counsel teams in product liability cases involving occupant restraint systems, accelerator systems, truck and car tires, electrical equipment, and overhead cranes. Representing clients in employment cases involving retaliation and discrimination under state and federal law. Representing insurance companies in coverage matters and litigation. Melissa prides herself on her client service and has been recognized nationally by BTI Consulting Group for her delivery of outstanding client service. Defended a wrongful death lawsuit in the U.S. District Court for the Southern District of Texas. Plaintiffs alleged the late deployment of airbag caused the death of their daughter. Developed testimony and other evidence to show Plaintiffs had no evidence of a “defect” in client’s product, nor had Plaintiffs presented the requisite evidence to prove alternative design under Texas law. The court granted summary judgment in favor of client, and excluded certain testimony proffered by Plaintiffs’ airbag expert. Flynn v. American Honda Motor Co., Inc., No. 11-cv-3908, 2014 WL 6964655 (S.D. Tex. Dec. 8, 2014); and Flynn v. American Honda Motor Co., Inc., No. 11-cv-3908, 2015 WL 75270 (S.D. Tex. Jan. 6, 2015). Defended a retaliatory discharge case against a tire manufacturer in the U.S. District Court for the Southern District of Illinois. Obtained summary judgment on behalf of client in the district court and prepared briefing before the U.S. Court of Appeals for the Seventh Circuit. The Seventh Circuit affirmed the lower court’s summary judgment dismissal in a reported decision, Phillips v. Continental Tire the Americas, LLC, 743 F.3d 475 (7th Cir. 2014). Defended an automotive component part supplier in a product liability suit in Madison County, Illinois. Successfully argued and briefed forum non conveniens motion and obtained dismissal of client. Defended case in which Texas Medical Center, four of its member institutions and Thermal Energy Corp. filed suit against the Metropolitan Transit Authority of Harris County and the firm's client, one of the contractors hired to construct the Houston light-rail transit system. Plaintiffs alleged that stray electrical voltage leaked from the rail line. Argued summary judgment motion and obtained dismissal in client’s favor. Defended leading automation technology client in two product liability cases in state court in Denver. Plaintiffs alleged permanent injuries from a malfunction of a high-rise escalator at Coors Field when the escalator began speeding. The client supplied a component of the escalator, which inspector’s report concluded caused the malfunction. Developed testimony and other evidence that client’s component had nothing to do with the malfunction of the escalator. After depositions of Plaintiffs’ expert and the inspector, Plaintiffs dismissed client from both cases with prejudice. Defended product liability claim involving allegations that a light-rail vehicle was defective because of an insufficient horn and bell warning system. Plaintiff was hit by light-rail vehicle and was injured. The court granted motion for summary judgment because client complied with specifications provided by the local public transportation provider, a co-defendant.